crown lynn wine cooler any ideas? 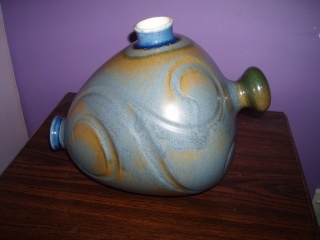 purchased 1981-82 at the Crown Lynne Penrose seconds outlet.24cm high x 32 cm length,blue denim colour with yellow/olive highlights ,whorl pattern almost a maori design .Made in New zealand and 1286 on base. Hopefully I've managed to post photos.Bugger no pics I'll try again. I have never seen the likes of that...... maybe it had a spigot....somewhere? What are those 'squiggles' on the place where it rests upon chef? Hi ev re the squiggles I think it's just reflection from the wrought iron table it's sitting on,it didn't come with a spigot,actually it belongs to my sister-she bought it from the seconds shop. I like the weird things and things that are slightly unusual and this really caught my eye on trade me. It was sold as a decanter but I think the water might fallout. Is there something missing from this, and what is it really called??? 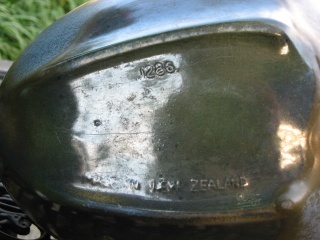 It has the infamous Made in NZ markings and the numer 1286. Regardless of what it actually is, I just love the bizarreness of it. According to some notes I have from the Auckland Museum the 1286 is called a "Wine Cask"
Cool, thanks for that. I think I still need to use my imagination on how it would work, but I must b missing a cork or two. Hi Kate,thats the same shape and number of the one I posted on December 1 last year,under pottery identification but I mistakenly described it as a wine cooler. 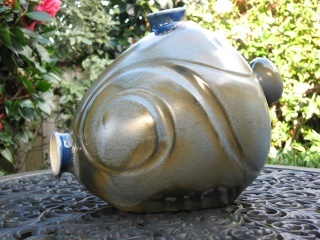 chef wrote: Hi Kate,thats the same shape and number of the one I posted on December 1 last year,under pottery identification but I mistakenly described it as a wine cooler.